: New Rubric: "They Say, I Say"
New Rubric: "They Say, I Say"
One of our first demo rubrics is now available for anyone to use in their own EssayTagger assignments! Gerald Graff was one of my professors at the University of Illinois at Chicago during my M.Ed. program. 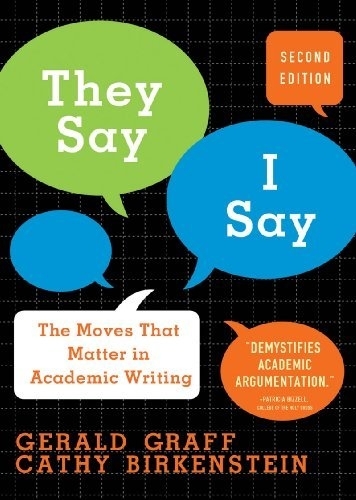 And, I'll be honest, I was very wary of "They Say, I Say" when he first explained the concept of the book to my class. But TSIS quickly won me over. And the skyrocketing sales that he and his wife/co-writer have enjoyed certainly show that others appreciate its value as well. But there was one thing I noticed -- the book does not address assessment. I love the guidance it offers for teaching composition and the structure it gives to developing writers, but I felt like there was a missing final chapter on how to evaluate the resulting TSIS-style essays. So I began developing a TSIS-style rubric that would work within the EssayTagger system. I met with Prof. Graff to show him an early draft and his eyes lit up with enthusiasm. This rubric is listed as a "work-in-progress" because, well, it is. But it's a pretty dang good start. And keep in mind that any rubric shared on EssayTagger is meant to be a starting point. Teachers should alter and customize these rubrics however they see fit. Latest Update: Rubric sharing and rubric import!